After quite a few fights between Mr. and Mrs. Elf things escalated to the point where the neighbors called the cops. To get out of jail-time they both agreed to see a marriage counselor. So Mr and Mrs Elf setup up a session with the local marriage counselor. 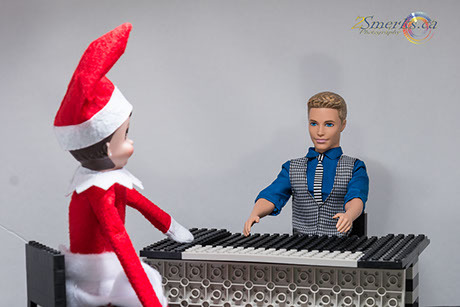 After a long heated discussion between the three, the counselor asked Mr. Elf to excuse himself so that he and Mrs. Elf could have a one on one session to discuss her feelings about what she witnessed that faithful, or should I say, unfaithful night. Once Mr. Elf exited the room Mrs. Elf and the marriage counselor discussed the situation between Mr. and Mrs. Elf. Mrs. Elf expressed her feeling openly. She spoke about how he does not treat her as well as he used to, before they moved from the north pole. Mrs. Elf was able to calm down some, and started opening up more, and more. Maybe she opened up just a little to much. Things went from professional to a little too personal, a little too quickly. Mrs. Elf ended up throwing herself up on to the desk and started making googly eyes at Mr. Counselor. He asked her repeatedly to "Please sit back down in the chair" and tried his best to bring the session back under control. Apparently Mrs. Elf had a different idea, and started to get closer, and eventually started crawling all over the counselor.